Do you hear those sirens? They're coming for you. But if you're fast enough, you can outrun them. The cops are on the chase and they're looking to get their money back – and stop you from snagging more. Welcome to Cash Bandits, a 25-payline online slots game that sends you on a race around town to grab loot before the cops can grab you. You're definitely not handcuffed in this one. There are so many opportunities to pop a big payday. 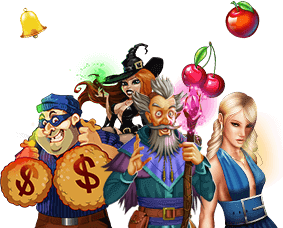 Cash Bandits comes with two big jackpots, including a Major Jackpot with a $1,000 reset amount and a Minor Jackpot with a $250 reset amount. There's also a 30,000x your bet per line top award, tons of rewarding symbols, and a special Vault that leads to as many as 50 free games with big prize multipliers. So what are you waiting for? Grab your lock pick and go to town! Ready to mad dash across town and grab some loot? It's easy to get started with Cash Bandits. First, make your bet and line selections by clicking the little up and down arrows located beside the Bet and Lines button. This tells the software that you want to lower or raise your amount. Don't worry. If you change your mind, you can keep altering your bet. It's not final until you click the Spin button. Doing so locks in your bet and tells the reels to start spinning. When they come to a stop, you'll win if you've successfully lined up qualifying symbols. To see which symbols pay out big, click the Help icon at any time in the game. Despite the fact that robbers don't really obey the law, there is some method to their thieving madness. Believe it or not, strategy does come into play in figuring out which stores to hit. Cardinal rules involve robbing only at night and ensuring that the coast is clear. While you can play any time of day, there are still some things you can do to make out like a bandit. Never bet more than 5% of your bankroll on one spin. Doing so could mean that you'll lose a lot of your balance and no longer be able to play. Vault: The substitute symbol in the game, the Vault can complete a winning combo when you're short a needed symbol. It can't sub in for the scatter symbol, though. Cops and Robbers: The scatter symbol in Cash Bandits, the Cops and Robbers symbol pays out in any direction. Hitting 3 of them in on a regular spin leads to The Vault bonus round. Major Jackpot: One of two jackpots available in Cash Bandits. It pops randomly and never drops below $1,000. Minor Jackpot: The second of two Cash Bandits jackpots. This one has a $250 reset amount and also pops randomly.